This Blueberry Chia Overnight Oats is the perfect breakfast on the go loaded with berries. Combine Oats, Yogurt, Milk, chia seeds, Maple Syrup & one portion of Blueberries in a Jar. Give it a good mix. Cover and let it sit overnight in the refrigerator. If you notice the oats has gone thick, add more milk in the morning. The next morning, Portion the Overnight Oats between the jars , top it with remaining blueberries and some toasted almonds. 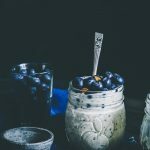 Enjoy your Blueberry Chia Overnight Oats ! !